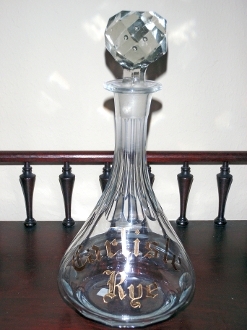 Carlisle Rye back bar bottle decanter with gold embosed letters. Cut glass neck & base. Stands 7 3/4" alone & 9 3/4" with stopper. The stopper looks to be added. The gold lettering looks good. No chips or cracks on decanter. Stopper has small chip on base. Displays really nice.